an idea, do a line drawing, scan it in. Then I’ll get an assignment and abandon the sketch, making a solemn vow to return posthaste to add color and finish it. Sometimes my posthaste is significantly delayed. Funny how cartoon grapes can subtly convey a universal truth: It’s hard to leave. Hard to leave family and friends who are often emotionally invested in holding us back, keeping us right where we are. The old “If you succeed, then I fail” mentality. Huh. I seem to be in a very Freudian mood this morning. Here’s a detail image. I’m always telling clients that images can be creatively recycled. That you can get a lot of mileage out of a single image. 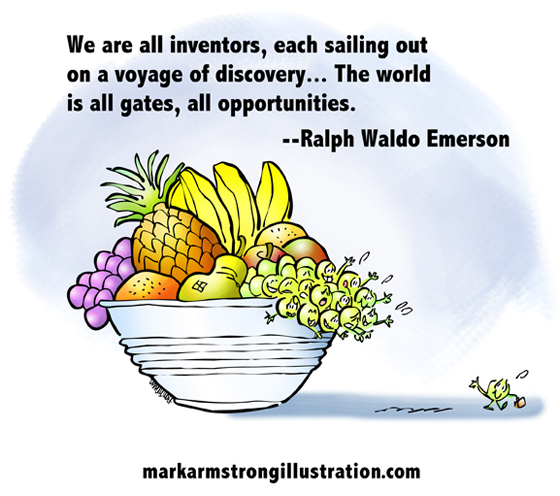 and poet Ralph Waldo Emerson. 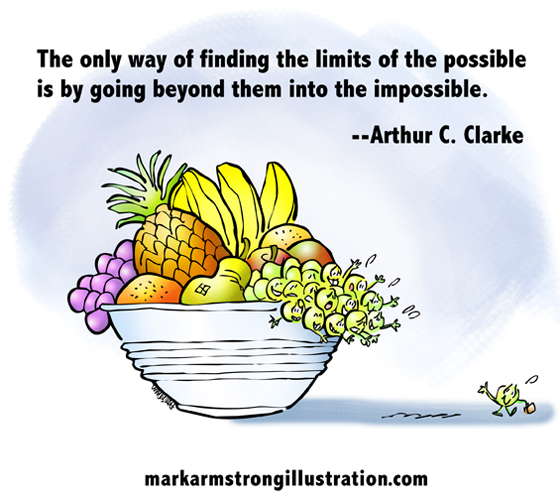 Or perhaps you’re a fan of the late science fiction writer, Arthur C. Clarke. Ever heard of Publius Terentius Afer? No? How about Terence, for short? He was a Roman playwright whose comedies were performed circa 170-160 B.C. His most famous quote is “I am a human being, nothing human is alien to me.” Hmm. Wonder if he’d still feel that way in 2015 A.D.?? 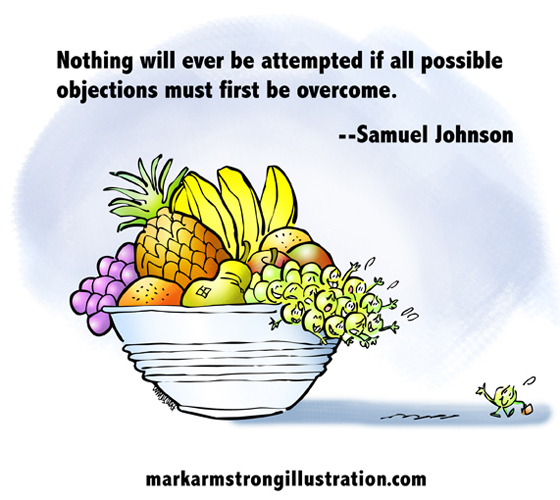 Samuel Johnson had something to say about almost everything. Here’s a good one to remember. You’ll never get anywhere without a leap of faith. And speaking of great philosophers, I’ve saved the best till last. Do you include images in your social media posts? 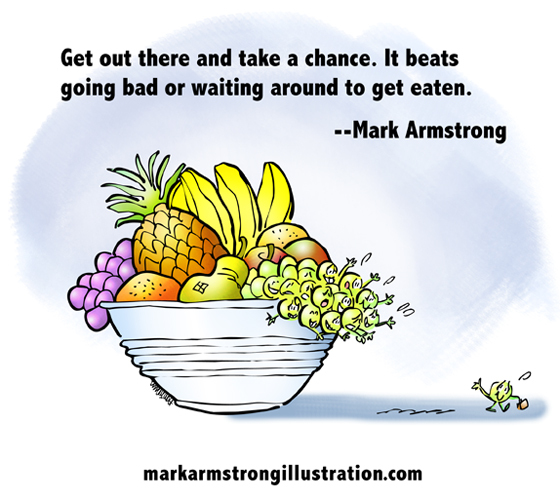 Ever thought about using illustrated quotes to help promote your business? Have you ever seen a grape carrying a little briefcase?? Reblogged this on Gemma Greaves. I like your quote best of all! Your art is so very uplifting and perfect. You must be such great fun at a dinner party!!! I hope you are planning for a creative week of making people like me – giggle – you know, Mark – there is just not enough giggling on the planet. I will vote into the Oval Office – the first person who makes the world giggle – but in a good way – not for anything icky, dirty, underhanded, dubious, illegal …I think you probably get my point – so Mark, will you please run for Office – I’ll make sure you get elected! Have a wondrous week, my kooky, talented friend. Your kind words are soothing balm to my fevered soul– and I dinna even know I had a temperature! Run for office, eh?? Chief Executive Gigglemeister… well, it’s a thought, as the craniologist said when he saw the synapse. With you as my campaign manager, I know it would be a wild and woolly, and delightfully zany ride. I’ll just need, what– $100 million or so?? I’ll take my shoeshine kit down to the corner of Spit and Polish, and start filling my campaign coffers immediately!! My kiddies did take care of their mom, on kiddie schedule. I did have a lovely Mother’s Noon! I would most definitely vote for you for prez – this country needs real humor, not the sick kind. 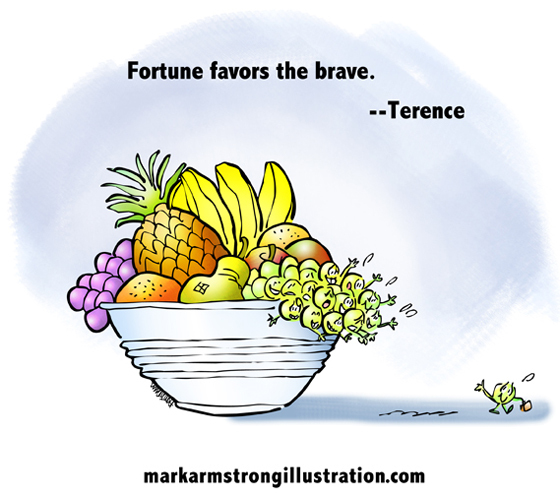 You have a fabulous week of cartoon creating, my talented friend. Your humour and talent extract so much spirit from a cute bunch of fresh grapes – wow! 😀 At the risk of sounding like a parrot (that found its wings, of course), this post is truly awesome and inspiring, thanks! 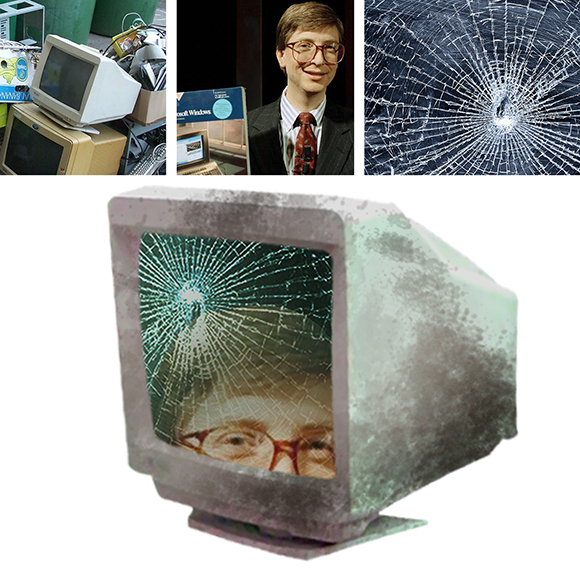 Bill Gates… yes, he’s mentioned in the Bible, isn’t he? Something about The Gates of Hell. Truly prophetic. Microsoft updates– and their demonic nature– are clearly implied. Poor Bill– he’s cracked. Reading about the construction of Bandhani made my eyes ache. Tying pinpoints of fabric with a single thread?? I’m lucky if I can wrap old newspapers with twine!! Yes, I learned a lot, my gray cells are approaching overload (it doesn’t take much). Graphic illustration of one picture saves a thousand words, or how an illustration illuminates a pithy quote. Really enjoyed your grape leaving the bunch. Glad you liked the post, very nice to meet you, and thanks so much for your kind comment! Can’t beat the Mark Armstrong quote! Come to think of it, can’t beat that damn good cartoon either! Painters. 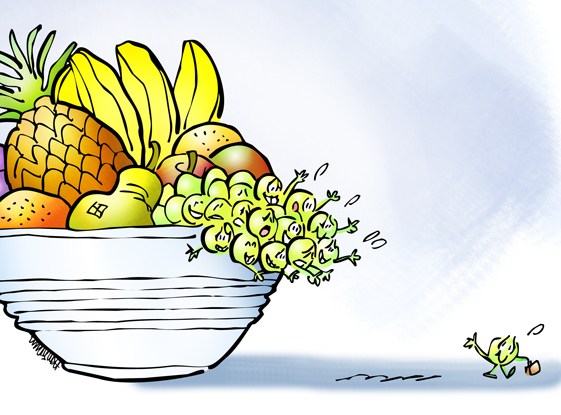 They never get tired of painting bowls of fruit, right? I wondered about this. Is it a classic art assignment? Seems to make sense to me- contrasts of color, various shape compositions and textures to practice technique, and so on. Images are now key to marketing & communications..
..Do you include images in your social media posts? All the time. It really does seem to be a really effective way to get people’s attention. Overall, I don’t see much Internet content that doesn’t have a lot of imagery, and I think that’s even including the long-form articles from periodicals. They’ve always got a solid photo or video at the top. An Artist’s Journey: Get The Balance Right! Images can be a very effective educational tool, and I was creating street-style signs to encapsulate the abuse recovery tips I’ve been learning. I did it to help myself internalize the information. It seems like the way to go. I saw a video recently by Cracked.com that nailed that dead-on; a new segment they’ve got called “New Guy Weekly”. The “new guy” on their staff does it, and he said something about doing this VERY thing to get noticed in comedy, actually. Hi, Jak! I can see you put a lot of thought into this comment. Many thanks for your kind feedback. Funny– I’d never really considered why one sees so many Bowls Of Fruit paintings. I’m sure you’re right: every painter paints still lifes to learn technique– and what could be easier than setting up a bowl of fruit?? I’m sure keeping things simple (when one is starting out) is also a factor. I enjoyed your “Get The Balance Right” post. Inspiration is everywhere. The key, of course, is being open to it. That, and a willingness to free-associate! I agree: illustrated quotes and comedy are a perfect combo. Great way to attract attention and get noticed– either as an artist or a gagwriter. I remember seeing Cracked Magazine on newsstands when I was a kid. Competing with Mad was tough, since the latter had a much more talented stable of artists and writers (IMO, anyway). 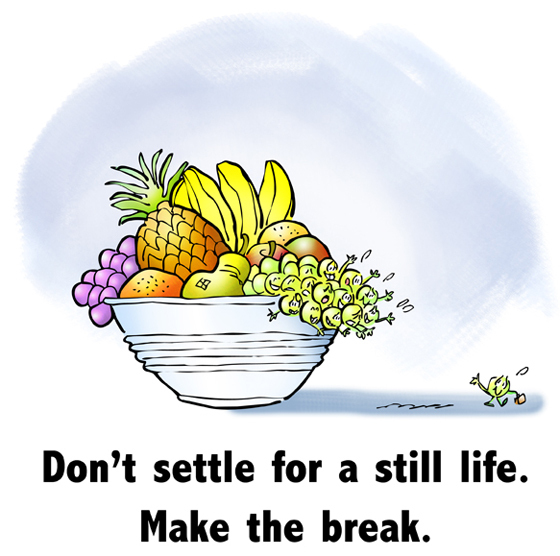 Once you’ve been mixed in the bowl, a fruit ripe for the taking – to be picked at and picked from, you’ll notice its time to leave the bunch when you’ve had the juice squeezed right out of you. Nice to meet you, Nita, and many thanks for your kind and good-humored comment. That’s really what I needed to hear today , thanks for making my day . I enjoyed your page a lot . Ha! Yes, what is there about advice that causes us great excitement, then we forget the whole thing 5 minutes later?? And if we put up signs, they soon become invisible to us?? I suppose the answer lies in the old truism: We become what we do. If we’d just start executing the advice, and keep executing it, we might see some beneficial results. But there’s always something more interesting to do– like watching fruit flies leaving their nasty little footprints all over our grapes and bananas!! Haha! The last one by that famous humorist Markie MacGiggles is my favorite one! What a great cartoon. And oh the caption possibilities are endless! In fact, I think this is a fantastic concept for a children’s story. I found myself wondering where he would go and what he would do. My visit here today started my day off just right! Say, I like your idea about a children’s story! The Little Grape Who Left Home. Did he get squashed crossing the street? Did he wind up in a bowl of Jello?? Did he start his own vineyard and become rich and famous?? Lotta possibilities there– I must give that more thought!! What fate awaits the lonely grape? Sounds like the sort of deep philosophical question you’d hear at some deep thinkers symposium!! Loved your musings, and the thought of a grape having a deadly encounter with a possum of all critters, made me bust out laughing! I don’t think I’ll ever be able to look at a bowl of fruit the same way again!! Thanks so much for favouriting my tweet of the crocodile comic. It’s much appreciated. Cheers. Mark!! What a delight this is! So true, so insightful, so creatively layered with wisdom. Wish I’d seen it in April but I’m very happy to see it now because the power to inspire never expires. “The power to inspire never expires.”– wow!! That sounds so– so– profound!! You really must do something with that– seriously!